A recently published study by the Public Library of Science concludes that "high dose intravenous vitamin C appears to be remarkably safe." Not bad from an allopathic study! Of the 9,328 patients for whom data was available, there was less than 1% who reported adverse side effects. Of those reporting side effects, 93% simply reported fatigue, lethargy, or change in mental status (probably from the procedure rather than the vitamin C). You can read the report at: Vitamin C: intravenous use by complementary and alternative medicine practitioners and adverse effects. "With the current book, Thomas E. Levy MD JD, joins Albert Szent Gyorgyi MD, PhD, Linus Pauling PhD, and Frederick R. Klenner MD, among others, on the list of vitamin C's heroic researchers." "Dr. Levy's book presents clear evidence that vitamin C cures disease. It contains over 1,200 scientific references, presented chapter by chapter. It does not mince words. It is disease specific. It is dose specific. It is practical. It is readable. It is excellent." "At a time when EU legislation is set to ban many vitamin and mineral supplements, a few enlightened doctors are willing to educate us about the benefits of taking them." "Levy's book is unmatched in the medical literature. The Vitamin C Foundation credits Levy with doing an almost impossible feat of reading, analyzing and clearly explaining the meaning of massive science behind vitamin C"
This is a must read for anyone concerned about good health and long life. Order Curing the Incurable today. Curing the Incurable may be the most important, life-saving, life-extending book you'll ever read. · Vitamin C can prevent, reverse, and/or cure a host of infectious diseases like herpes, hepatitis, AIDS, West Niles Virus, Rocky Mountain Spotted Fever, killer influenza viruses, and others. Vitamin C is a powerful antidote against the toxic effects of pesticides, pollution, poisons, and prescription drugs you face every day. Are you getting enough Vitamin C... at the right time...in the right form... to ensure maximum immunity and longevity? · vary by individual - we all need a different amount. · vary throughout the day, week, month, and year as your microbial load, dietary intake, stress level, toxin challenge and the health of your immune system change. can be easily determined when you know how to interpret the signs your own body is already giving you. Dr. Levy is one of the world's leading Vitamin C authorities. In one of the most current, scholarly, and complete books ever written on this subject, he provides all the information you will need to determine your particular Vitamin C needs and how to best meet them. Vitamin C is the optimal choice for conquering most viral, bacterial, and fungal organisms that continue to plague mankind. Plus, it is also able to neutralize nearly every toxin and venom capable of killing humans and animals. Documentation in Curing the Incurable proves that the success of Vitamin C as a therapeutic agent is ALWAYS dose-dependent. You'll see that properly dosed Vitamin C within a comprehensive treatment protocol can eliminate the need for many vaccinations and toxic prescription medicines. Conversely, if you don't follow the appropriate protocol - especially if you don't take enough - you won't get the desired effects. According to Dr. Levy, under-dosing of Vitamin C will aid the development of nearly all the chronic degenerative diseases that affect man. In fact, a low somatic level of Vitamin C is often one of the primary reasons that many common infectious diseases are contracted in the first place. Bottom line: An "optidose" regimen of Vitamin C can help get you well and keep you well. Curing the Incurable tells you how - in plain English! That knowledge is now available in an easy-to-read, easy-to-understand, book Curing the Incurable by Dr. Thomas Levy. ...you need Vitamin C and the knowledge required to use it in a way that gets results! Order Curing the Incurable today. More than a half-century has passed since Dr. Klenner accurately documented and reported a complete, 72-hour cure for polio - using an aggressive Vitamin C protocol - to the American Medical Association. The information ran counter to what they wanted to believe. No action was taken. In the following 10 years, polio crippled and killed thousands upon thousands of children. These lives and billions of taxpayer dollars could have been saved if the right people had heard and heeded this information. During the last 50 years, many other researchers have demonstrated equally impressive cures from diseases presumed to be "incurable" using various Vitamin C protocols! Vitamin C is arguably the most studied, safest, and most powerful anti-microbial, toxin-neutralizing agent known to modern science and yet the keys to unlocking its power remain a mystery to all but a handful of medical practitioners. Severe lack of accurate information renders much Vitamin C use unhelpful, even counter-productive. Of those savvy enough to choke down a handful of Vitamin C tablets every day, very few know when, what form, and how much of this unrivaled supplement they need. Studies were completed and published - some decades ago - but they have not been readily available to or understandable by the majority of the lay public. Perhaps more scandalous are the dusty stacks of proof that have gone virtually unnoticed by a disinterested medical community. Dr. Thomas Levy, a board-certified cardiologist - who is also an attorney - has assembled and assimilated thousands of medical and scientific studies. Now, Curing the Incurable: Vitamin C, Infectious Diseases, and Toxins lays out the iron-clad case for using Vitamin C in the treatment of many medical conditions and diseases once thought to be incurable and often fatal. Now his shocking findings are available for all to see in an easy-to-read, easy-to-understand reference. Over 440 pages of convincing evidence in Curing the Incurable reveal the dozens of hidden, unexploited truths about Vitamin C. And, these facts are backed it up with over 1,200 scientific references. Most MDs and traditional medical professionals are afraid to use Vitamin C with their patients. It's not what you think! The reason will shock you and also provide hope. Even if you know all there is to know about Vitamin C, you'll want to get a copy of Curing the Incurable for your family doctor. Studies prove that Vitamin C can prevent most infectious diseases and neutralize most toxins. · Does your current Vitamin C intake protect you from flus and colds? · Will it fend off the swarm of infectious diseases that roam the planet? · How about the legions of toxins in your food, air, and water? ...and the degenerative conditions associated with premature aging and death? Had the right people known the disease-fighting power of Vitamin C, countless sons and daughters, mothers and fathers could have been spared the agony and death polio brings. Perhaps you are old enough to remember the images... infants struggling to breathe in iron lungs... poster children in leg braces and wheelchairs... March of Dimes campaigns to raise millions of dollars to fight this dreaded disease... The senseless ignorance that crippled and killed thousands upon thousands is appalling! Vitamin C protocols similar to Dr. Klenner's have also been used to cure many other contagious diseases - like viral hepatitis, encephalitis, and herpes. All considered incurable by most medical textbooks and medical practitioners. We live in "the information age" - the information is available - yet 99% of the population remains uninformed or misinformed about the unparalleled scope of Vitamin C's antibiotic, anti-viral, anti-fungal, and toxin-neutralizing qualities. Another case of senseless ignorance! 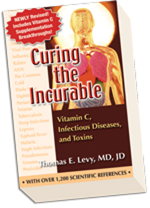 Medical doctors, medical journals, nutritionists and alternative health care providers have been awestruck by the scope and health-changing potential of Dr. Thomas E. Levy's Curing the Incurable. This is a must-have book for anyone interested in health and longevity - and especially anyone who currently supplements with Vitamin C.
For the last 50 years the AMA has chosen to remain ignorant about the unmatched curing power of Vitamin C - will you? With thousands upon thousands of medical studies that demonstrate Vitamin C's power, why is there stone silence from the medical community and media? Sure, there are political and economic forces at work, but the major reason lies in a few studies that conclude Vitamin C does little more than prevent scurvy. It's true... if you only use the RDA - about 90mg - Vitamin C is of little benefit. With similar methods, I could prove that your dishwashing detergent is ineffective. I'd just put a single drop of it into a 55-gallon drum of greasy water, try to wash a scorched spaghetti saucepan, then publish the dismal results. As is true with all therapeutic agents, the protocol - amount and method of Vitamin C administered - is as important as the Vitamin C itself. Researchers have identified 6 factors of an effective Vitamin C protocol. If any of the factors is missing or insufficient, the therapeutic value of the Vitamin C administered may be lost. How much Vitamin C do YOU really need and how should you be using it? Undoubtedly, you are already taking Vitamin C. But, are you taking enough, in the right form, at the right time, and in the right way to stave off the host of degenerative diseases and conditions associated with aging and increasing toxin exposure? Are you even taking enough to keep from contracting the common cold or flu? Are you taking enough to maintain your immune system at its optimum level? How would you know, how can you tell? If you're not sure, Curing the Incurable: Vitamin C, Infectious Diseases, and Toxins has the answers. · Traditional health care continues to chase after more expensive drugs, equipment, and procedures to solve health problems, while more effective, less expensive therapies are ignored. · Many infectious organisms have so effectively developed a resistance to conventional antibiotics that traditional practitioners consider them incurable. · The threat of an Anthrax or Smallpox epidemic has increased dramatically with the rise of global terrorism. · Toxic chemicals in our food, water, and air are unavoidable. Retroviruses like AIDS have infected millions - many millions will die! Who do you think will be expected to pick up the tab for the grossly expensive, relatively ineffective treatments that will be doled out in incomprehensible numbers? This ghastly waste of lives and money is avoidable. There are many other facts about Vitamin C that you need to know. Dr. Levy gives you the whole truth in easy-to-read, easy-to-understand terms. More importantly, the information is backed by over 1,200 scientific and medical citations from the mainstream, peer-reviewed, medical journals across the world. When can Vitamin C be a prooxidant? How do large doses of Vitamin C affect a G6PD deficiency? Should Vitamin C be used in conjunction with Intentional Immune System Suppression? What is the Rebound Effect and how can it be avoided? There's much more to be found in the 448 pages of Curing the Incurable. Just the answers to the questions above could save you money, your health, and perhaps your life - all much more valuable than the price of this landmark book. Buy Curing the Incurable today for only $19.95! Plus... Order today and get FREE shipping!